Buoy Health, which offers an AI-powered tool that serves to help people understand potential health problems, announced a partnership with CVS MinuteClinic. 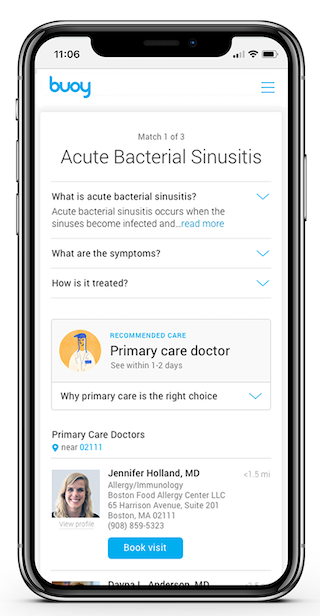 When users go through Buoy Health’s online or app-based chatbot interface, if the suggested possible diagnoses lend themselves to treatment at one of the 1,100 MinuteClinics around the United States, the app will do two things. First, it will use GPS to locate the nearest MinuteClinic, and second, it will offer to hold a place in line for the user. Obviously the partnership will also benefit CVS by sending individuals to the MinuteClinic who otherwise might not think of it. Buoy Health launched in March 2017 and raised $6.7 million in August. Le says the company has seen significant traction in the meantime. What’s more, the visitors capture an interesting segment of the market, gathering data on patients in the early stages of symptoms that can then be used to train Buoy’s machine learning algorithm to be even better. Le says MinuteClinic is a first step: the company hopes eventually to be able to automatically refer users to a number of different services based on their particular needs.